COPS golden girls, from the left, Poppy Richardson, Jade Goode and Mia Leech. 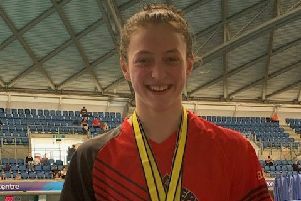 City of Peterborough Swimming Club (COPS) will head to the British Championships in Sheffield at the end of next month with a record number of qualifiers. Out of a club membership of 120, COPS will have an impressive 31 swimmers in action at the big event at Ponds Forge from July 28 to August 2. Many made their mark at the recent ASA East Regional Championships in Norwich to gain qualifying times. On day one of those championships, COPS made a superb start to finish on top of the medals table. They won seven gold medals with six of them coming from their girls’ squad. Mia Leech (13) and Lauren Harrison (14) won their finals of the 200m breaststroke in 2:47.72 and 2:46.84 respectively, Jade Goode (11/12) and Anna Blakeley (13) delivered victories in the 200m medley in 2:38.39 and 2:32.08 respectively, and there were also golds for Poppy Richardson in the 14yr 50m butterfly (30.44secs) and Maddison Saunders in the 14yr 200m backstroke (2:26.55). In the boys’ events, Harvey Norman was a COPS winner in the 14yr 400m medley (4:55.17). Although Team Ipswich were the most successful club on day two, COPS still had plenty more to celebrate. Leech and Richardson both claimed two more victories with Leech winning the 13yr 400m medley (5:21.28) and 100m breaststroke (1:19.53), and Richardson taking the honours in the 14yr 400m medley (5:12.93) and 200m butterfly (2:26.97). There were also further COPS wins for Goode in the 11/12 400m medley (5:35.03) and Saunders in the 14yr 100m backstroke (1:08.28). After the third and final day, it was Team Ipswich who topped the medals table with 17 golds - just one more than COPS. COPS’ gold rush was completed by Saunders (14yr 50m backstroke - 32.40secs), Goode (11/12 100m butterfly - 1:11.22) and Richardson (14yo 100m butterfly - 1:07.30). COPS also swept the board for top overall female in each of the three age groups thanks to Goode (11/12), Leech (13) and Richardson (14). Head coach Ben Negus said: “It was a great championships for us. A sign of the depth of our talent was the fact that we finished with all three of the top girls at the meet. Several COPS swimmers also gained national qualifying times at the Cardiff International Open meet. This was a massive meeting involving 93 clubs and 900 swimmers and COPS picked up stacks of medals. Tom Wiggins produced a great swim in his 100m breaststroke heat which ranks him in the top 15 in the country. Gold - Olivia Lee 5, Jamie Scholes 3, Harvey Norman, Bethany Saunders, Mia Leech, Katie Brown, Rachel Wellings, Mollie Allen. Silver - Mia Leech 4, Mollie Allen 2, Harvey Norman 3, Olivia Lee 2, Katie Brown, Bethany Saunders, Tom Wiggins, Christie Woods. Bronze - Rachel Wellings 2, Olivia lee, Harvey Norman, Sophie Crowther, Cameron McRae, Christie Woods, Tom Wiggins. Chloe Hannam returned from America, where she is studying on a full sports scholarship in Arkansas, to post some impressive times for COPS in the Northampton Open in Corby. Two of them rank her in the top 10 in the country. Bethany Saunders had a great meet too, clocking a top five UK rankings time in the 200m backstroke and swimming huge personal bests in other events. Other COPS winners at this meeting were: Maddison Saunders (2), Poppy Richardson, Leah Roughan, Lauren Harrison and Hannah Jaszkiewicz. COPS took 50 swimmers from their development and mini squad to the Fenland Level Three Open Meet at Manor Leisure Centre in Whittlesey and came away with 27 golds, 23 silvers and 13 bronze medals. On top of this medal haul, the club achieved six top swimmer awards out of the 14 available. Top Girl winners were: 9 yrs - Jessica Mahoney (5 golds); 11 yrs - Brenna Howell (3 golds, 2 silvers); 12 yrs - Poppy Ludgate (4 golds, 1 silver); 14 yrs - Neave Sauer (5 golds). Top Boy winners were: 11 yrs - Fabian Brudnicki (3 golds, 1 silver, 1 bronze); 12 yrs - Jake Lawless (1 gold, 1 silver, 1 bronze).